Tern Sunrise, Little St. Simon’s, GA. This image was created with the tripod mounted Canon 500mm f/4 L IS lens, the 2X II TC (now replaced by the 2X III teleconverter) and the Canon EOS-40D (now replaced by the Canon EOS-7D). ISO 800. Evaluative metering +2/3 stop: 1/500 sec. at 8. Focused manually by necessity. Many folks who see this image congratulate me on creating this image in Photoshop. It is, however, straight out of camera :). Over the course of the next month or so, I will present nine additional images in this series for a total of twenty in all. The last will be followed by several revelations including two major ones. Canon EOS-7D). Possibly the best value ever digital camera body…. 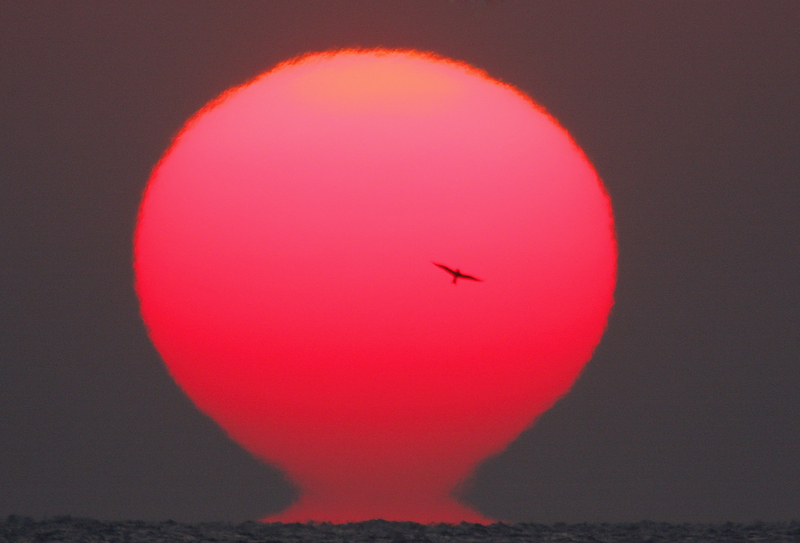 Well, the bird makes the image so special, distinguishing it from a “mere” shot of the setting sun. Technically speaking, it reminds me that when I was a film photographer I spent lot of money in rolls devoted to the setting sun 🙂 While it seems that there are just so few things on the shot, there are often very funny optic effects. I even remember to have photographed a “novaja zemlja” which is a strange, extreme effect that makes the sun, already beyond the horizon, to appear on the sea as a flat stip of melt metal (I understand that the effect is common at very high latitudes, while I saw it in the Mediterranean). Digital cameras have definitely been an improvement for my wallet. On the other side, while I’ve not dedicated myself to shooting at the setting sun as in the past, I’ve got always problems with the exposure. In short, either I have burned out parts, or the rest of the world is extremely dark. Film seemed to handle this kind of shots better, but perhaps it’s just me. Honestly, I didn’t try with my latest 14 bit camera, which could handle the exposure better. So far I’ve found that the only way to get a non burned shot, with a non extremely dark surroundings, is to hope for a thick layer of foggy atmosphere just over the sea. Your opinion? I don’t quite know what to say about this image Art, it grabs my attention, but I don’t know if I’d want a print on the wall. I will say it’s a very interesting image. It would be nice if the bird were a little sharper and tilted in the other direction. However, we all know that with nature/wildlife photography, we have to take what nature offers. This is still a nice image. Thanks for sharing. Very dramatic and apocalyptic. Is the base at the bottom a reflection from earth, or some refractive effect? It would certainly be a keeper for me, though not because of the bird. I love those telephoto views of rising/setting sun, and the blood red color on this one is awesome.